Lazer Ladies On-The-Go » Create a Buzz at Your Booth! Create a buzz at your booth! 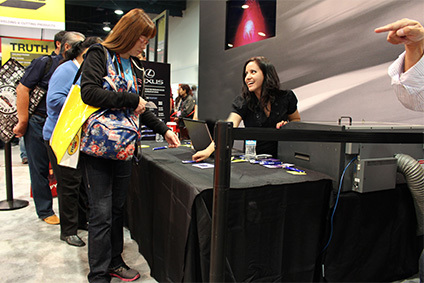 Lazer Ladies On-The-Go can help your booth be the highlight of any event! We work directly with event attendees to engrave promo items or gifts on the spot. We can personalize almost anything! We believe a memorable experience is the key to keep people coming back. Don’t give away another gift that will soon be forgotten, invest in the whole experience! We just need a little info to give you a quote. A Lazer Lady will contact you. Personalize any promo item on-the-spot! Promotional trade show products are an essential staple to a successful exhibit. We will add a special touch and quality to your promo items when we personalize them on the spot. This unique touch will leave a remarkable impact, even when the show is over. Our 1-on-1 Interaction makes your brand memorable and ensures your items are something to show off. Lazer Ladies On-The-Go can be set up anywhere within the continental U.S. Fill out the form above to get your quote today. Do we have to provide the item? You can or we can help provide the perfect item. Let us know if you have a product in mind, and we will verify if your item is compatible. 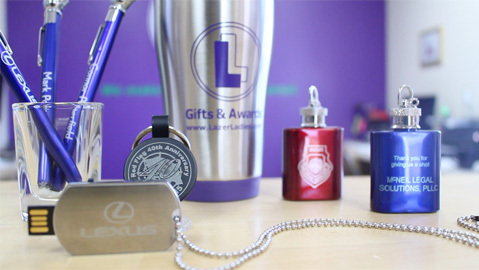 Lazer Ladies can source promotional items or help design/create a custom product to suit your guest and event. What items can you engrave? Contact us for your free personalized estimate. Yes, purchasing your promo item through Lazer Ladies will result in extra savings! Can you travel outside of Las Vegas? Yes, Lazer Ladies On-The-Go can set up just about anywhere. Create a memorable experience that will attract attention and keep people talking about your brand. Invest in the whole experience, not a giveaway that will soon be forgotten or thrown away. copyright © 2018. Lazer Ladies On-The-Go. All rights reserved.